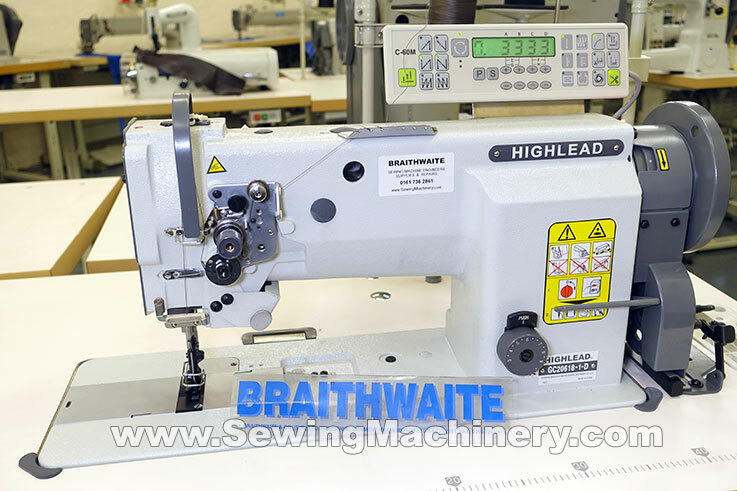 Highlead GC20618-1D heavy duty walking foot lockstitch industrial sewing machine with automatic thread trimmer and operator aids. This model is fitted with the advanced large vertical axis mounted hook assembly & drive transmission; which usually perform better than the standard & cheaper horizontal axis hook type set-up; when using thicker threads and heavy materials. The application of needle bearings for arm shaft and hook shaft, cog belt driving, auto oil lubrication system and triple feeding by needle bar, walking foot and bottom feed: combines to make the GC20618-1D quiet, smooth running, durable and versatile. It also features a safety clutch assembly which is fitted to help reduce hook damage should the machine become jammed etc. The Highlead GC20618-1D is a feature packed heavy duty sewing machine and as well as compound feed (bottom feed, needle feed & walking foot) and automatic thread trimming, it comes as standard with programmable auto back-tack, auto reverse, knuckle quick reverse and built in stitch program module. It is fitted with the latest quiet & energy efficient electronically controlled heavy duty motor, which only runs when you are actually sewing; If you pause or stop: the motor stops immediately and is almost silent. leather, vinyl, webbing, coated fabrics and upholstery material etc. It is suited to sewing, for example, car seats, general upholstery and leather articles, belts, canvas, tents, awnings, handbags, outdoor wear, banners, camping goods etc.